When you see the words “Death” “Metal” and “German” arranged in the same phrase, you can pretty much guarantee that your eardrums are in for a heavy beatdown. While BURDEN OF GRIEF may be slightly more forgiving, they still inject your veins with pure, adrenaline-maxed melody that sounds positively uplifting at times. Not unlike NE OBLIVISCARUS or ROTTING CHRIST in the way that they hide beauty in the shadows. Like so many legends before them, BURDEN OF GRIEF wanted to play like the bands that shaped their sound. They were most fond of early Thrash and 90s Goth like PARADISE LOST and TYPE O NEGATIVE. While it’s difficult to hear the Goth influences in BURDEN OF GRIEF’s songs, the Thrash influences are unmistakable. The band seeks to arrest you, throw you into the chaos of a maelstrom in “Eye of The Storm”. “The Angel” sweeps you into additional fray and fury, channeling HARAKIRI FOR THE SKY, a sound that is both sixteen tons heavy, yet remains lightning quick. The three-part epic of “Broken”, “Wolf Moon” and “Killing Spree” tell the story of a man consumed by rage-induced power trips, money, and a serious case of Alphamale-itis. After running off into the woods to start a new, simpler, Walden-inspired life, the man becomes a recluse. He hides in his cabin all day from other people until he goes out and starts killing people in the same toxic society that he was once a part of. Still coasting on the bloodlust of the last track, “Breathe One’s Last” stamina doesn’t let up until “A Dying Breed”. “The Funeral Cortege” hosts possibly the most aggressive funeral procession (re: Cortege) in history. There are lead guitars teasing Djent-y riffs and drums firing off at a runner’s pace rather than the solemn march that is supposed to be common at funerals. Whoever passed, I’m sure BURDEN OF GRIEF gave them a hell of a send-off, regardless. 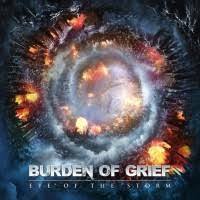 BURDEN OF GRIEF, while hard-hitting and unafraid to back down from a fight, they show that they have their moments of joy caught within the chaos.